At around 5:35 p.m. ET on Wednesday, Japan's currency traded around 104.80, up a whopping 4 percent in a sudden move. 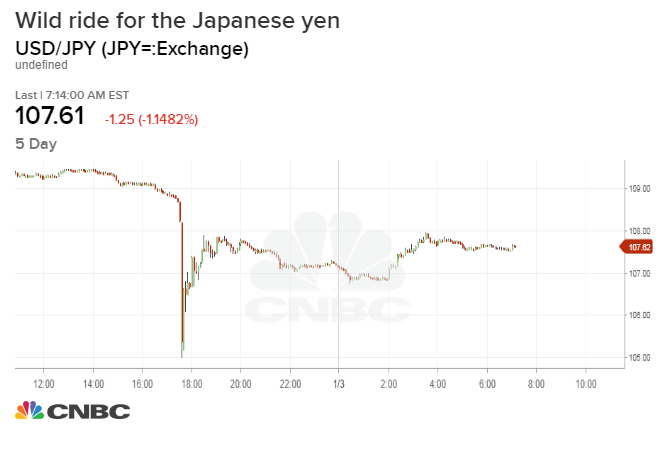 Earlier in the day, the yen traded around 109 per dollar. Charles Perrin, a trader at J.P. Morgan, said the move happened shortly after Apple slashed its first-quarter guidance. "It is difficult to pinpoint the original cause," Perrin says in a note. "Whichever the case, it felt like a perfect storm of factors." 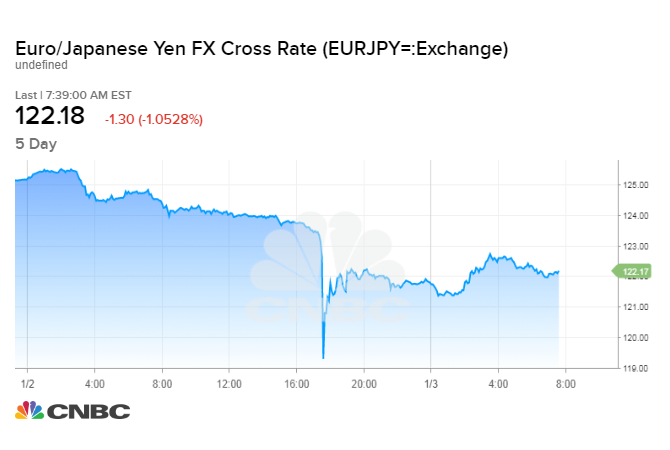 The Japanese yen hit its highest level since March against the U.S. dollar on Wednesday evening after what some traders are calling a "flash crash." At around 5:35 p.m. ET on Wednesday, Japan's currency traded around 104.80, up about 4 percent in a sudden move. Earlier in the day, the yen traded around 109 per dollar. The currency traded at 107.74 versus the dollar on Thursday morning ET, down more than 1 percent. Charles Perrin, a trader at J.P. Morgan, said the jolt happened shortly after Apple slashed its first-quarter guidance. Apple, which cited an unexpected slowdown in China, plunged more than 8 percent Thursday morning, also sending global stocks plummeting and stoking fears of a global economic slowdown. The yen is sometimes viewed as a safe haven currency during times of global tumult. "It is difficult to pinpoint the original cause," Perrin said in a note. "Whichever the case, it felt like a perfect storm of factors that contributed, including poor liquidity with Japan on holiday and a market already poised for risk-off." The yen also saw volatile moves against other currencies. 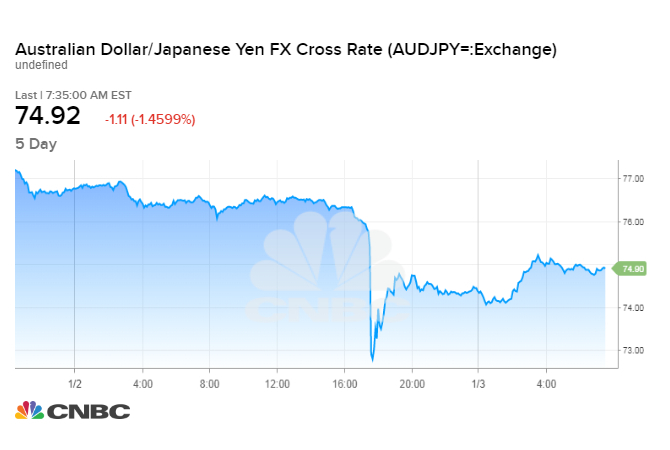 Against the Australian dollar, the yen rose to its highest level since 2011, reaching 71.47 on FactSet. It was up 1.2 percent versus the Aussie at 75.08 Thursday morning ET. Against the euro, the yen hit 122.14 after hitting its highest level since April 2017. The yen also surged against the Turkish lira, pushing it below 20 for the first time since late October. "The moves have partially retraced … however still resemble a flash crash," said Craig Nicol, macro strategist at Deutsche Bank, in a note. "So it would be a stretch to say that there's much conviction at the moment with moves in markets over the last couple weeks hardly healthy." The yen's sharp moves come in a time of heightened volatility across financial markets. Last week, the Dow Jones Industrial Average posted its first-ever single-day move of more than 1,000 points. The 30-stock index also recorded 12 moves of at least 1 percent in 19 trading days last month. —CNBC's Michael Bloom contributed to this report.